Your website should be the cornerstone of your business. In most cases it will be your customers first impression of you and your business, so it’s important that you make those first few seconds when a visitor lands on your page count. My advice to you is to hire a reputable graphic designer who will create a beautiful and functional web site for your company. I promise you, this will be the best money that you ever spend on your business! You can easily have a new site created for a reasonable amount of money. Visit www.guru.com, odesk.com or elance.com (odesk and elance is now upwork.com) to post your job and find a great designer. When designing your pet sitting website it’s important to communicate with your designer exactly who your target market is and what it is that you’re looking to accomplish. Remember, designers are great at creating beautiful sites, but not many know and understand the business side of things. You need to let them know exactly what should be included. The first essential is your contact information on each and every page of your website. I know this seems like a no-brainer, but how often are you on a site where you can’t fine the phone number? Pretty often, right? You don’t want your visitors to ever have to search to find a way to contact you. Also, we’re now in the mobile age where a large percentage of your pet sitting prospects will be on their phones when they land on your page. Make it easy for them to reach you. All they should have to do is point and click to call your office. The second essential is to establish the “know, like and trust factor” with your visitors. I know I’m always harping on this, but in our industry this is crucial for converting visitors into paying clients. Think about it this way… our new customers are in essence giving strangers the keys to their homes and trusting them to take care of and safe-guard their most prized possessions. They need to visually see you and immediately get the feeling that you are a person for whom they can trust and rely on. How do you do this? You add a video of you on the homepage of your site. I know everyone’s first reaction to this is, “no way!” That was certainly my first reaction, but I’m telling you if you want to bring in tons of new clients, video is a MUST! The third essential is testimonials from happy clients. Social proof is one of the best and most cost-effective ways to convert prospects into paying clients. If they can see that your current customers are raving fans they will be much more likely to use your service. If you don’t have testimonials, go and get them! Ask your clients if they wouldn’t mind writing a few words about their experience with your company. If you’re just starting out, be sure to go above and beyond the call of duty for your new clients (you should always do this,) then follow-up with them afterwards to see if they were happy. If they are, you ask them for a testimonial. Try and get into the mentality of going and getting the things that you need but don’t have versus having the mindset where you say, “I don’t have that, so I’m not going to do that.” You won’t get too far in business if this is the way you think. Your Homework Assignment: Go and do it or go and get it! If you don’t have a website, get one! Websites are so inexpensive these days; there is really no excuse to not have one. If you don’t have a website you will lose credibility with your pet sitting prospects and you will fall drastically short against your competition. If your website is basically a virtual brochure it’s time to upgrade. Hire a designer and get a professional site created. Be sure to include the contact information on each and every page. Record a video of you on your homepage. If you can’t afford to have a professional one created then have friend record it for you on your phone. It doesn’t matter! You just want your prospects to know, like and trust you. Gather testimonials for your site. Download my 12 Website Essentials Infographic right below this post. 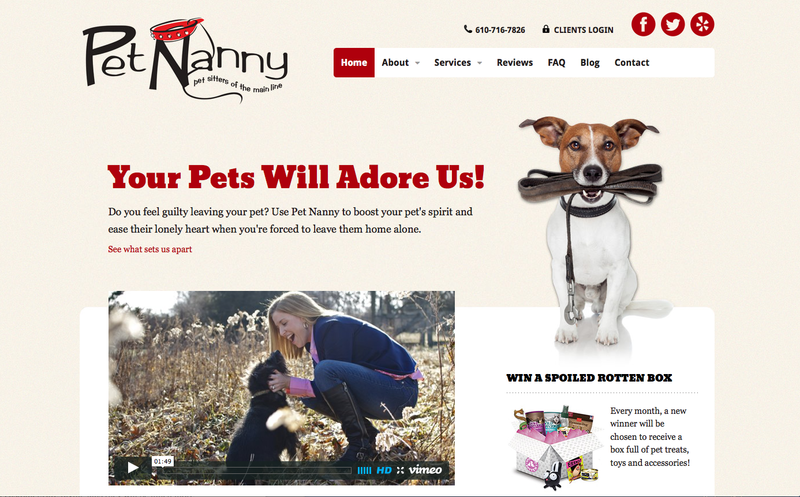 This will help you to create your new amazing pet sitting website! Hey there, Newbie Pet Sitter! Are you feeling stuck or overwhelmed with starting your pet sitting business? Fret no longer, my friend. I’ve got ya covered! Grab my Complete Checklist For Starting a Pet Sitting Business. This resource is 100% FREE and is my gift to you. Don’t wait any longer to get started and streamlined. You’ve got this!